Architect: Wurster, Bernardi & Emmons. This attractive ten-acre garden city within a city is comprised of low-rise and high-rise apartments, grassy areas and paths, and a sculpture wall. Pedestrian walkways are kept safely away from roads. The design was by top modern architects. Besides WB&E, Vernon DeMars and Edward Larrabee Barnes were involved. A proposal to densify this little district by replacing the low-rise buildings with high-rises riled Sacramento's dedicated band of modernists. They fought hard to preserve Capitol Towers and to stave off its replacement, Sacramento Commons. But despite some victories (including state approval of the neighborhood's listing on the National Register), they appear to have lost. Planners approved of the change in part because Sacramento Commons would qualify as a "transit priority project." The neighborhood, by the way, is a short walk to the State Capitol. 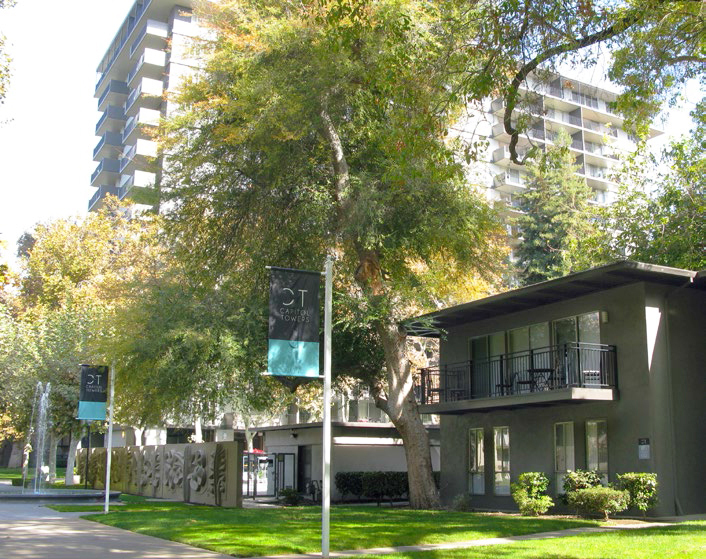 The National Register nomination, prepared by the group Sacramento Modern under leader Gretchen Steinberg, cited Capitol Towers as "a well-planned and well-designed example of urban redevelopment housing." Millard Sheets redefined roadside architecture as something that went beyond gaudy, goofy, and 'Googie.' He gave it class, like you'd find in an art museum, by designing dozens of banks throughout California (and, later, beyond) and adorning them inside and out with art created by himself or by artists belonging to a stable he'd created around his studio in Claremont. It's amazing how many of these immediately identifiable Sheets banks, many originally for Home Savings, still entertain passersby in towns large and small. It is shocking that one of Sheet's most prominent works on one of the most prominent sites faces destruction. 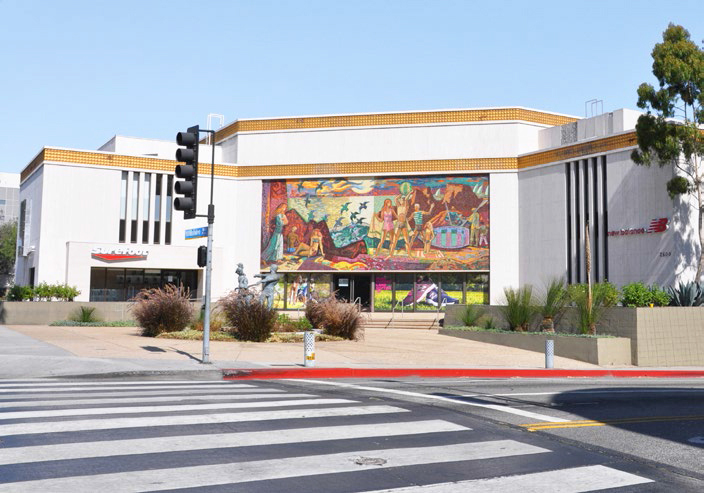 The owner of the former Santa Monica branch, which in recent years has been used for retail, plans to rip it down but donate its exterior mural to the city. The Los Angeles Conservancy, which is trying to save the building, notes of it, "Sheets' design for the Santa Monica location introduced some new variations to his Home Savings branch designs, including a building plan that features two wings projecting at 45-degree angles from the front elevation, framing the entry plaza. The building is itself positioned at a 45-degree angle to the corner of the lot." 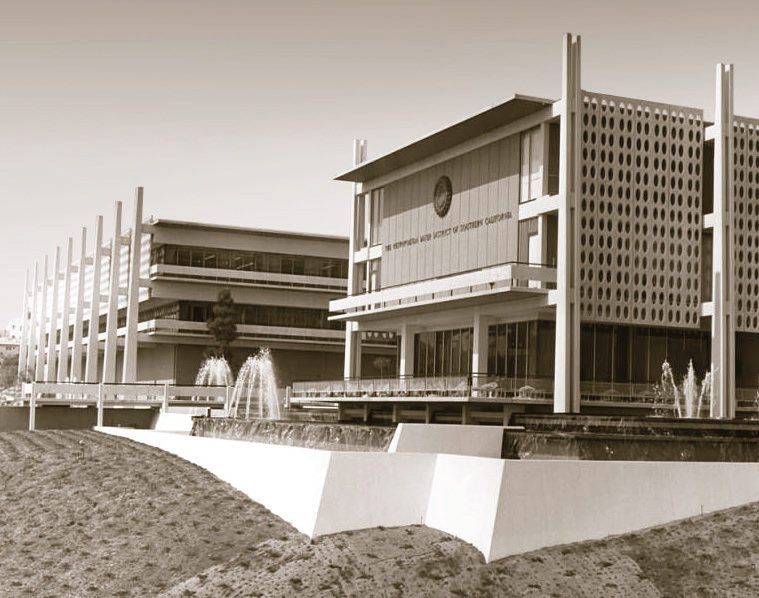 During his career, William Pereira and firm designed office towers, campuses, banks, and entire city plans. The firm's most famous building is San Francisco's Transamerica Pyramid. Yet today so many of his projects are coming down that folks in Los Angeles have formed a project 'Pereira in Peril' that has brought 100-plus people to meetings to save Pereira's buildings. Although a Pereira-designed tower for the MWD was restored and converted into residences next door, the low-rise campus, with its concrete screen walls, is "threatened by demolition, with plans to reconstruct fragments [of the original design]," says author and preservationist Alan Hess. "That's not preservation. It's not even an homage." Like other Pereira projects, the building floats above a decorative pool of water. The developer plans to replace the Pereira structure with a million square feet of condos, apartments, hotel rooms, and more. The MWD campus is a crucial work in Pereira's career. "It marks a definite turning point in his career, setting up new ideas about Southern California, turning away from the International Style of past projects…," Hess says. "He was much more responding to the culture and climate of Southern California with the integral sunscreens, the terraces, the water [feature], the landscaping." To devotees of movie palaces, S. Charles Lee (1900-1990) is a star on the order of Clark Gable. Lee believed the design of movie theaters was as important to the movie-going experience as the films themselves. "The show starts on the sidewalk," he would say, and anyone who has visited his grand cinema palaces in Los Angeles believes it. The Star, though, in the small city of La Puente, 35 miles east of Dodger Stadium, is something else entirely. It's simple, innovative, modern in its functionality and use of new materials and forms, and it is threatened by plans to build condos on the site. At least two groups are fighting to preserve the historic theater, including one made up of locals. 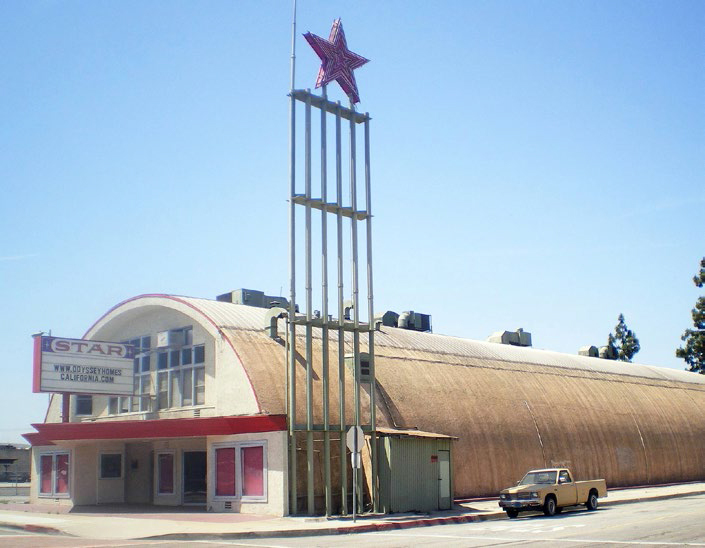 The other is the Los Angeles Conservancy, which says of the Star: "Lee's design for the Star Theatre is directly influenced by two important postwar-era trends: lingering wartime restrictions on building materials and the growing prominence of the automobile."